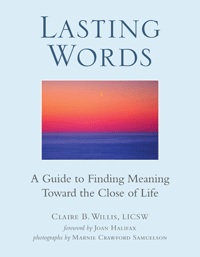 Watch Claire’s interview with Peter Bermudes about Grief on Wide Angle. on VoiceAmerica Health and Wellness Channel. This e0course is “Available on Demand.” For more details and to sign up for the e-course click here. Date: Saturday, April 30th; 10:30 a.m. – 12:00 p.m. Date: Saturday April 30, 2016, 1:30 p.m. – 2:30 p.m.
Click to listen to replay. Book Launch: March 25th, 2014, Brookline, MA Brookline Booksmith, 279 Harvard Street, Brookline, MA, 127 people and 110 book sold at the launch event! 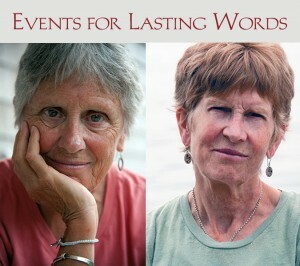 May – June, Boston Medical Center 3 Week Workshop: Creating Lasting Words for Ourselves and Those We Love based on Lasting Words. More Information.